MBS is once again thrilled to emblaze Dylan Warren’s signature on another pro model, this time with art direction from Dylan himself. As usual the board rides as good as it looks. Dylan’s favorite bits are the new and improved deck lay-up, our stiffest and poppiest yet thanks to additional tensile fiberglass, and the new MBS Metal Matrix II trucks with their ultra-strong high-precision 6061-T6 aluminum top trucks. At Dylan’s request we’ve shortened the wheelbase by approx 3/8″ (1cm) to allow for easier manuals and bigger ollies while decreasing the chance of bottoming out off big jumps. For the other components we’ve used Dylan’s standard favorites – MBS F5 Bindings, MBS Rockstar II hubs, and MBS T1 tires. But for the griptape we’ve used Dylan’s brand new Passenger brand griptape, a super coarse 36 grit tape for superior lock. Dylan rides with MBS F5 heel straps (sold separately) so consider a set of those if you want to take your riding to the next level. 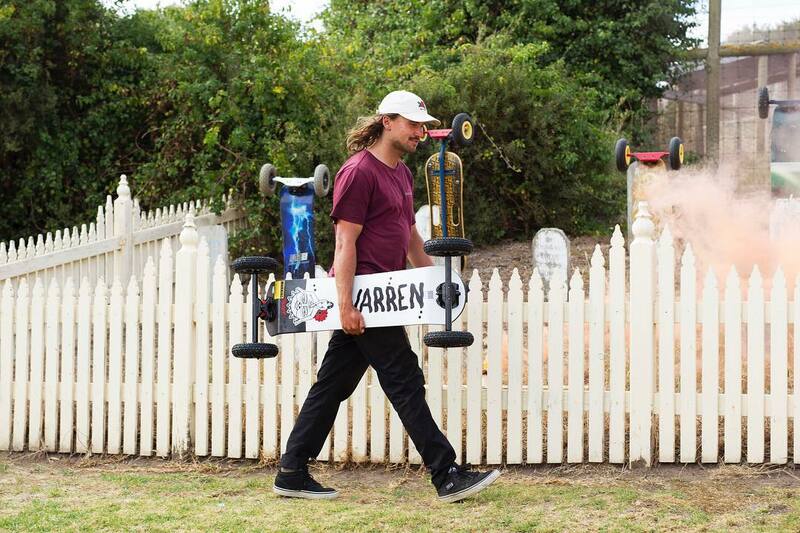 Find out more about the new MBS Pro 97 – Dylan Warren II.